Learn the basics of anaphylaxis, ways to reduce risk, and the recommended emergency treatment. Download this flyer and share! 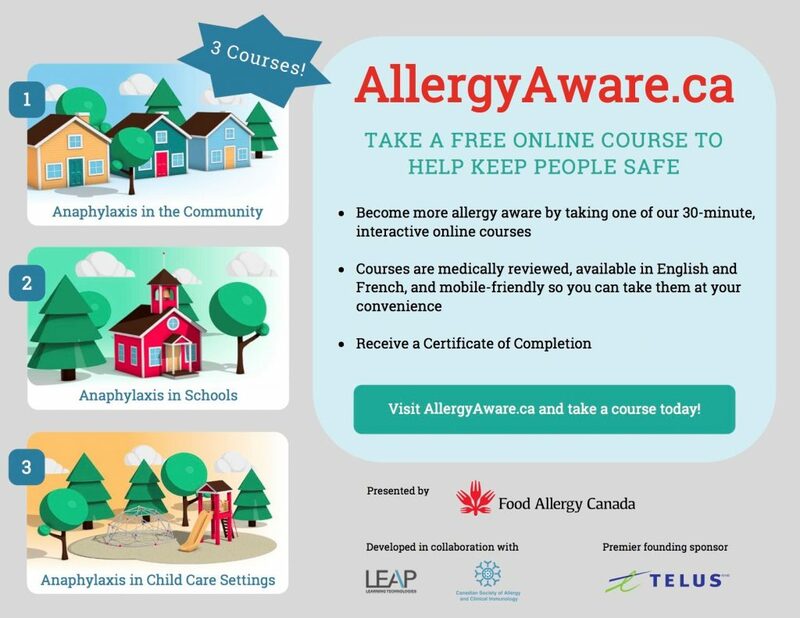 Take our free online course through AllergyAware.ca. These courses have received awards for interactivity and design. Learn the basics of anaphylaxis, ways to reduce risk, and the recommended emergency treatment through AllergyAware.ca. The courses are in English and French. There are three courses: Community, Schools, and Child Care Settings. The courses are interactive and mobile-friendly. Each course takes approximately 30 minutes to complete. At the end of each course you can download your very own personalized certificate of completion. This course is great to share with family and friends. Perfect for the teachers and staff at your child’s school. Have your caregivers, and other child care staff take this course. The courses were developed by Food Allergy Canada and Leap Learning Technologies Inc. in collaboration with the Canadian Society of Allergy and Clinical Immunology. Download our flyer on these courses to share with others.